Wir sind selten so rational, wie wir es gern wären. Testen Sie sich selbst und finden Sie Vorurteile und Denkmuster, derer Sie sich vielleicht bisher gar nicht bewusst waren. We like to think of ourselves as rational beings. However, quite often we make decisions which, on further investigationbei näherer Untersuchungon further investigation, to turn out to be sth.sich als etw. erweisenturn out to be rather erraticunberechenbarerratic. The reason is simple: we’re very busy beings, too. Often we simply don’t have the time to to mull sth. overüber etw. nachdenkenmull things over and instead we just to go with one’s gutnach seinem Bauchgefühl handelngo with our gut. What we call our “gut feelingBauchgefühlgut feeling” consists of a variety of simple rule of thumbDaumenregelrules of thumb, such as “If I have a good feeling about it, it’s probably a good thing”. Psychologists call these rules “biasVoreingenommenheitbiases”. They help us to manoeuvre in an overcomplex world — by ruthlesslyrücksichtslosruthlessly simplifying problems that we to encountersth.auf etw. stoßenencounter. And they often to yield sth.etw. ergebenyield useful results: you might never be able to decide upon an ice cream flavour if you didn't somehow feel like eating a strawberry sundae right now. Still, you might not want to rely on those same biases for complex decisions such as choosing a job applicantBewerber(in)applicant or an investment strategy. 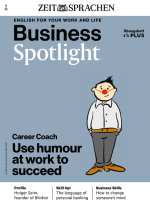 This is why, in the July–August issue of Business Spotlight, you can read more about unconscious biases and the obstacles they create in modern business life — especially when it comes to diversity. How to be biasedvoreingenommen seinbiased are you? You might be to tempt sb.jmdn. verleitentempted to answer: “Not at all.” To prove you wrong, we’ve put together a few questions that help you find out more about your own biases. The riddles are taken from classical psychological studies. Underneath each question, there’s a hidden section with additional information about the underlying bias and the corresponding research. Don’t worry if it turns out you’re biased. We all are and always will be. But by becoming aware of your biases, you can give them less direct influence on your decisions. The answer is not $0.10. The ball costs $0.05, the bat $1.05. Many people have been asked to solve the “bat and the ball” problem. Among students of Harvard, MIT and Princeton, more than 50% got it wrong. And “even among those responding correctly, the wrong answer was often considered first”, the authors write in their study. The “bat and the ball” problem is part of the Cognitive Reflection Test, which helps show the difference between intuition and deliberatebewusstdeliberate, reflective thinking. What is interesting about the riddle is not that the intuitive answer is wrong but that so many people don’t to double-check sth.etw. nochmals prüfendouble-check their solution with a simple inverse calculationUmkehrrechnunginverse calculation. “Many people are overconfidentallzu selbstbewusstoverconfident, to be prone to sth.zu etw. neigenprone to to place faith in sth.Vertrauen in etw. setzenplace too much to place faith in sth.Vertrauen in etw. setzenfaith in their intuitions,” says grand master of bias research Daniel Kahneman in his book Thinking, Fast and Slow. Source: Shane Frederick: Cognitive Reflection and Decision Making (2005). There is no wrong answer to the question: from the information we’re given, Alan and Ben have exactly the same character traitCharakterzugcharacter traits. Still, you might have to feel inclined to do sth.geneigt sein, etw. zu tunfelt inclined to hire Alan rather than Ben. This is a classical demonstration of the halo effect: we often use information that we learn first or which is especially prominentmarkant, hervorstechendprominent to form a first impression. 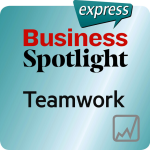 Consequently, we evaluate any new information in the light of this first impression. In this case, “the order of listing of traits influences the impression formed from the given set of traits”, as social psychology pioneer Solomon Asch puts it in the research paper this example is taken from. In other words: since you first learn that Alan is industriousfleißigindustrious and intelligent, you to regard sb. with favourjmdn. mit Wohlwollen betrachtenregard him with favour. Consequently, you might interpret the adjectives “critical” and “stubborneigensinnigstubborn” through rose-coloured glassesrosarote Brillerose-coloured glasses (“He seems to be an intelligent, critical thinker and a very persistentbeharrlichpersistent person”). With Ben, things look different: we first learn that he’s enviousneidisch, missgünstigenvious. This tempts us to evaluate the following character traits in a much more negative light. Source: Solomon Asch: Forming impressions of personality (1946). Read the following description about a woman called Linda. Linda is 31 years old, single, outspoken and very bright. She majored in philosophy. As a student, she was deeply concerned with issues of discrimination and social justice, and also participated in anti-nuclear demonstrations. How likely are the following sentences about Linda to be true? Give a percentage. Use the points on the left to click through the sentences. Again, there’s no right or wrong answer to this question — Linda is fictional after all. However, there’s a wrong combination of answers that many people give. Go back to question 6 and 8 and look at the numbers: if your answer to question 8 is higher then the one for question 6, you’ve to fall for sth.auf etw. hereinfallenfallen for the conjunction fallacyIrrtum, Trugschlussfallacy. If you think about it for a second, it’s pretty obvious: that two statements are true at the same time can never be more likely than that only one of those statements is true. You don’t have to be a statistican to understand that principle. Still, many people are convinced that it’s more likely that Linda is a bank tellerKassierer/Kassiererinbank teller and a feminist than that she’s a bank teller. “Which alternative is more probable? A vast majority of university students still rated the second option as more probable. The reason behind this fallacy is simple: our intuition values stereotypes much more than statistics. And Linda’s description fits the description of a feminist so well that even people who’ve taken statistics courses follow their intuition. Sources: Daniel Kahneman and Amos Tversky: Extensional versus intuitive reasoning: The conjunction fallacy in probability judgment (1983), Daniel Kahneman: Thinking, Fast and Slow (2011). A cab was involved in a hit-and-run accident at night. Two cab companies, the Green and the Blue, operate in the city. a witness identified the cab as Blue. The court tested the reliability of the witness under the same circumstances that existed on the night of the accident and concluded that the witness correctly identified each one of the two colors 80% of the time and failed 20%. of the time. This riddle is clearly toughhier: schwierigtougher than the ones above. And unlike number 3 and 4, it does have a precisehier: bestimmtprecise answer: 41%. This number can be calculated by Bayes’s rule and combines two probabilities: 80% (the probability for a witness to get the colour of the car right) and 15% (the probability of the car to be Blue). You don’t have to know any details about Bayesian statistics to understand the underlying bias. You only have to understand what those 15% mean. They are what statisticians call a base rateBasissatzbase rate. The base rate represents the distribution within a certain group: for example, all the cars in the city. If only 15% of them are Blue, the probability that the next taxi you’ll see is also 15%. However, the base rate is often ignored. The reason is similar to the explanation behind the problem about Linda, the feminist bank teller: people are miserable intuitive statisticians. They attach much more importance to stories about cause and effect than to statistics. The testimonial(Zeugen-)Aussagetestimonial of the witnessZeuge/Zeuginwitness offers a story that feels credibleglaubwürdigcredible enough to ignore the base rate. Why it's wrong to ignore the base rate becomes obvious if we construct a somewhat absurd example. Imagine the witness said that the accident was caused by a man on a unicornEinhornunicorn. You know that unicorns make up exactly 0% of the means of transport in any city. Even if the witness was 95% reliableverlässlichreliable, you’d still judge the unicorn story 0% probable. Although 15% is a higher base rate than 0%, it’s still relatively low. Therefore, even with a a relatively reliable witness telling us the opposite, it’s still more likely that a Green cab caused the accident. Source: Amos Tversky and Daniel Kahneman: The Framing of Decisions and the Psychology of Choice (2010). 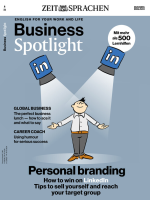 ... finden Sie in unserer Reportage in der Ausgabe 4/2018 von Business Spotlight: Robert Gibson erklärt, welche Vorurteile im Geschäftsalltag problematisch werden können und wie man sie vermeidet. Bestellen Sie in unserem Shop das Printmagazin oder E-Paper. Briten kommunizieren indirekt und arbeiten flexibler als Deutsche. Professor Peter Franklin spricht über kulturelle Unterschiede. Wissen Sie, wie lange eine Plastiktüte braucht, um abgebaut zu werden? Oder wie viel Fläche die größte Müllansammlung im Pazifik einnimmt? Schätzen Sie doch mal! Jessica Babich setzt sich als Direktorin von Save the Waterberg Rhino für den Schutz von Nashörnern ein. Im Interview erklärt sie, wie und warum.